There are a number of different Los Angeles fraud offenses that are frequently charged by prosecutors. Real estate fraud covers a broad category of criminal offenses involving housing, mortgages, rental agreements and foreclosures. Due to the high value of real estate, this type of fraud can often result in major financial losses and prosecutors tend to take these offenses very seriously. A person who has been charged with real estate fraud can face lengthy prison sentences and may be required to pay substantial fines and restitution amounts. There are several different forms of real estate fraud. Typically, a person who is accused of real estate fraud can be charged criminally with grand theft under California Penal Code Section 487 PC. However, there are also offenses specific to real estate fraud with which a defendant can be charged. If charged with grand theft, the prosecution would have to establish that the defendant intentionally deceived a property owner by making a false or fraudulent claim or representation, that the defendant did so with the intent that the property owner would allow the defendant to take ownership of the property and the victim agreed to transfer ownership of the property as a result of the defendant’s false representation. If the defendant is accused of committing foreclosure fraud, he or she can be charged criminally under California Civil Code Section 2945.4. Foreclosure fraud is often committed by people who claim to be foreclosure specialists and offer to perform services on behalf of defendants who are facing foreclosure. A person can be convicted of foreclosure fraud for charging fees for services before the service has been provided, charging excessive fees for services, placing a lien on a property as a form of compensation, receiving compensation from a third party without the homeowner’s knowledge, taking power of attorney or inducing the homeowner to sign an illegal contract that does not comply with statutory law. Another form of real estate fraud is rent skimming. Under California Civil Code Section 890, rent skimming involves failing to apply rent proceeds to pay a mortgage during the first year after purchasing rental property or falsely claiming to own property and renting out property and keeping the rent proceeds. Under the law, a person would not be liable for rent skimming if the rent money received was used to pay a necessary and unexpected healthcare cost on behalf of the person or a family member or if rent proceeds are paid to contractors to correct housing violations, if there is no other source of income that could cover these expenses. A person who engages in more than one act of rent skimming can face criminal prosecution. In many cases, real estate fraud may involve the use of forged or fraudulent deeds or other official documents. A person who files a forged deed or conveyance can be charged with filing a false document in violation of California Penal Code Section 115 PC. In addition, the defendant can also be charged with forgery pursuant to California Penal Code Section 470 PC. Real estate fraud can also encompass other criminal activity. There are times where buyers, sellers, real estate agents or appraisers can conspire to misrepresent the value of a property. 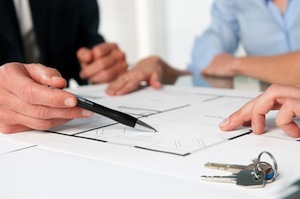 Presenting a false appraisal would be considered a form of real estate fraud. There also may be instances where a mortgage broker adds unnecessary and impermissible fees in order to increase his or her commission. This would also be considered fraud that could expose the mortgage broker to criminal prosecution. Grand theft, foreclosure fraud and multiple instances of rent skimming are considered “wobbler” offenses that can be charged as either felonies or misdemeanors. If convicted of a felony, the defendant could be sentenced to prison. If convicted of any real estate fraud offense, the defendant would be expected to pay restitution to the victim and the amount owed can be substantial. If you have been charged with real estate fraud or believe you are under investigation, it is important that you speak with a Los Angeles Criminal Defense Attorney immediately. Los Angeles Criminal Defense Lawyer Michael Kraut is a former Deputy District Attorney with over 14 years of prosecutorial experience who is highly skilled at representing clients charged with real estate fraud and other white collar crimes. For more information about Los Angeles real estate fraud, contact Los Angeles Criminal Defense Attorney Michael Kraut at the Kraut Law Group located at 6255 Sunset Boulevard, Suite 1480, Los Angeles, CA 90028. Mr. Kraut can be reached 24/7 at 888-334-6344 or 323-464-6453.